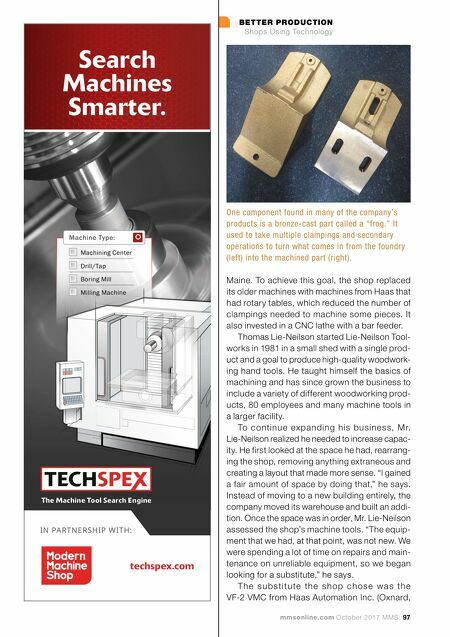 mmsonline.com October 2017 MMS 97 BETTER PRODUCTION Shops Using Technology techspex.com IN PARTNERSHIP WITH: Search Machines Smarter. Machining Center Drill/Tap Boring Mill Milling Machine Machine Type: The Machine Tool Search Engine Maine. To achieve this goal, the shop replaced its older machines with machines from Haas that had rotary tables, which reduced the number of clampings needed to machine some pieces. It also invested in a CNC lathe with a bar feeder. Thomas Lie-Neilson started Lie-Neilson Tool- works in 1981 in a small shed with a single prod- uct and a goal to produce high-quality woodwork- ing hand tools. 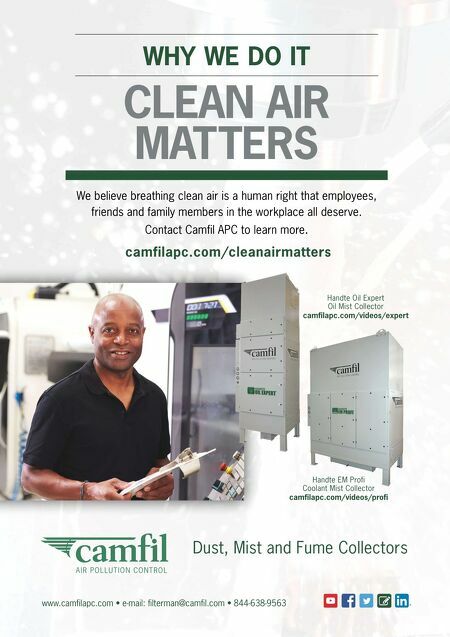 He taught himself the basics of machining and has since grown the business to include a variety of different woodworking prod- ucts, 80 employees and many machine tools in a larger facility. To c o ntinu e ex pa n d in g h is b u s i n e s s, M r. Lie-Neilson realized he needed to increase capac- ity. He first looked at the space he had, rearrang- ing the shop, removing anything extraneous and creating a layout that made more sense. "I gained a fair amount of space by doing that," he says. Instead of moving to a new building entirely, the company moved its warehouse and built an addi- tion. Once the space was in order, Mr. Lie-Neilson assessed the shop's machine tools. "The equip- ment that we had, at that point, was not new. We were spending a lot of time on repairs and main- tenance on unreliable equipment, so we began looking for a substitute," he says. T h e s u b s t i t u te t h e s h o p c h o s e w a s t h e VF-2 VMC from Haas Automation Inc. (Oxnard, One component found in many of the company's products is a bronze-cast part called a "frog." It used to take multiple clampings and secondary operations to turn what comes in from the foundry (left) into the machined part (right).